Grey squirrels are charming and intelligent animals that have adapted to live in a variety of habitats. They entertain people by their play, help them to connect to nature, encourage them to take exercise and enhance mental health. Most importantly, they are sentient creatures who should have their needs respected and who should not have their life opportunities cut short. So why would anyone want to kill them? Excuse number 1: they are not native. So what? They were introduced a long time ago and are now well established here. The “native” narrative is a current fashion in conservation and, like all fashions, will pass. Should we really sacrifice animal lives for an academic fad? Excuse number 2: we must protect red squirrels. Why and how? Red squirrels are not endangered or rare in the rest of the world, they just cannot live in England and Wales any more, due to deforestation. Red squirrels became virtually extinct in this country before grey squirrels came on the scene, and had to be repeatedly reintroduced from continental Europe. If people want to continue to try to re-establish red squirrels by peaceful means, e.g. reforestation or creating island “safe havens”, that is one thing. If they want to do it by continuously killing other animals, it is not morally justifiable. Excuse number 3: they pass squirrel pox to red squirrels. In very very few cases. 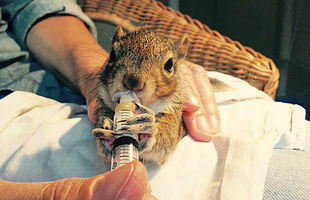 Squirrel pox is only one of a variety of diseases that red squirrels die from. The vast majority of unnatural early deaths of red squirrels are due to human activity (traffic, pets, poisoning, traps, etc.). Excuse number 4: they kill off our native birds. An extensive government-funded study has shown that they do not. While it is true that squirrels, both red and grey, might take an occasional egg, their activities do not reduce the number of birds as a whole. Excuse number 5: they destroy trees. In natural forests, exactly the opposite is true, squirrels plant new trees. In commercial forestry the damage is 5%, less than losses due to bad growing practises.